- Full metal EDF with highest grade aluminium alloy. 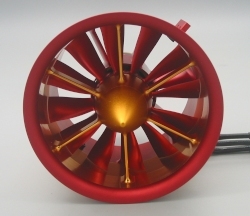 - 12 Blade Fan with incredible thrust and awesome jet-like sound. - Dynamically Balanced at the factory for super smooth operation. - All aluminum design dissipates heat for long motor life.